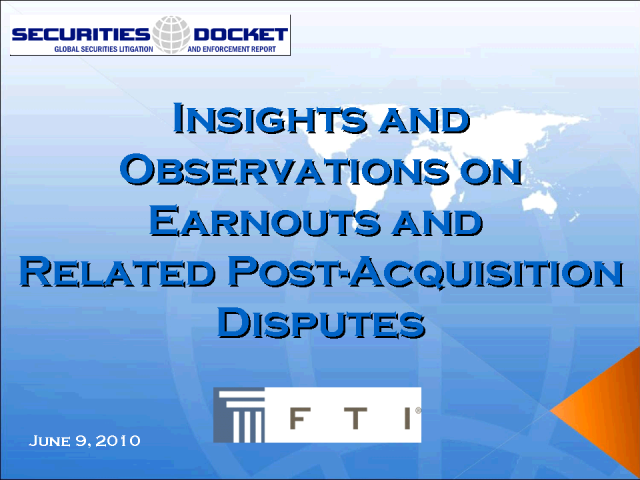 This webcast will introduce participants to the basics of the earnout as an element of the purchase price in M&A transactions and the common disputes that arise from earnout provisions. Our panel will discuss the common traits to earnouts, their appeal in the marketplace, earnout performance measurement, earnout payment calculation mechanics, and disputes regarding the post-closing operation and accounting of the target business, and more. The program is geared to lawyers involved in mergers and acquisitions. Jeff Litvak, Jack Schwager, Robert W. Fischer, Jr. Presented by: Jeff Litvak, Jack Schwager, Robert W. Fischer, Jr.